Goldman Halothane Vaporizer comes with provision of vaporizing chamber available in form of glass bowl or bottle that contains liquid anesthetic as well as a tap which helps in controlling proportion of gas that flows through it. Being drawover type vaporizer, its precision designs limit maximum concentration of Halothane vapor to 3% by volume. This is achieved irrespective of total gas flow provided through unit. The system allows adjustment through means of ratchet type control valve. The unit features glass jar being screwed on body and allows quick detachment for easy filling. Further, the vaporizer is also suitable with Trichloroethylene in low concentration. 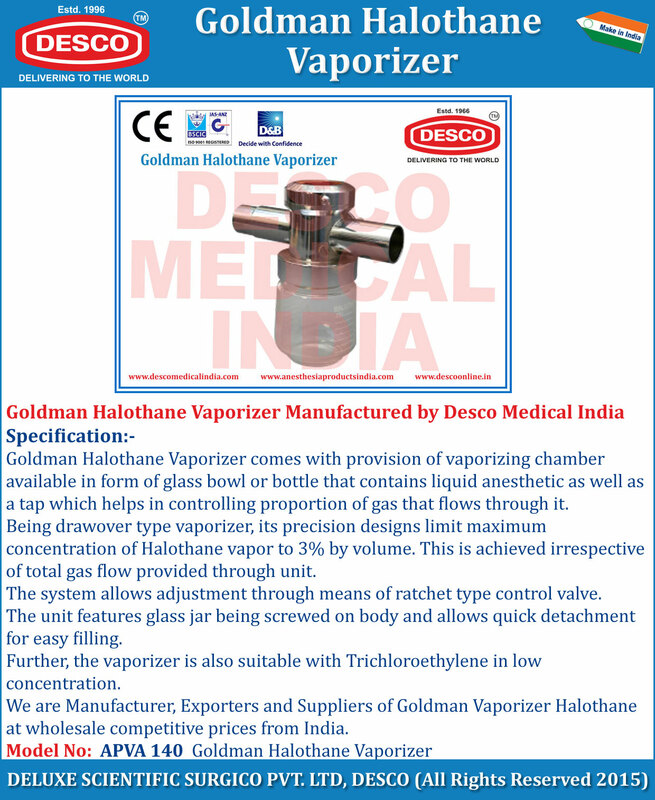 We are Manufacturer, Exporters and Suppliers of Goldman Halothane Vaporizer at wholesale competitive prices from India.